Until a few minutes ago, I’d always thought those red shiny plastic faux-cherry balls of sugar were called glacier cherries. I was just saying how little there was in common between them and the white-grey mass of ice and rock we could see on the mountain above us when Laura broke the news. Glacé apparently. Whatever next? We’re not in the Alps?! 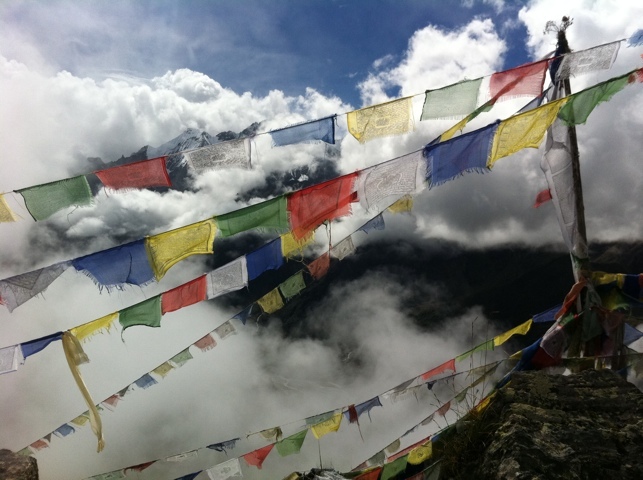 Well, greetings from Kyanjin Gumba, 3870m, halfway through our trek in the Langtang National Park in the Nepalese Alps. Ok, the Himalayas. We’ve had an eventful, energetic and mostly very enjoyable few days, working our way up the valley following the river to the glaciers that feed it. Firstly, there’s something I’m not going to write about until we’re safely back in Kathmandu. It concerns the bus journey here, which at two points was probably the most terrifying moment of our lives so far. Suffice to say, we now have a new phrase for the most impenetrable of paths – “The bus would do it!” ‘lest I condemn us to fate, more on that another time. Nepal is right at the end of monsoon season, but it’s not quite over yet. That means there’s a predictable rhythm to the day’s weather – and hence trekking. From mid afternoon and through the night, it pours with rain. This means that you really want to be tucked up in your next tea house (lodge) by then, so you set off early. Breakfast at six or six-thirty, just as the sun is rising, illuminating clear views of the amazing snow capped peaks around us. Within a few minutes of the sun hitting the rain-soaked mountainside, the evaporating water swirls into clouds and suddenly all disappears into an undulating mist of white and grey. After breakfast, we head off, trekking for 6 or 7 hours with a quick break for lunch, aiming to get to our tea house for the night by 3 just as the clouds have picked up enough moisture to pour it down again. As we’ve made our way up the valley, the scenery has changed from rocky canyon to lush damp jungle, and now to wide open mountain pasture, surrounded by peaks in snow white and rocky grey. The mountainsides are a mixture of forest in places and gorse and moss in others, punctuated with tiny bright flowers in yellow and blue – and occasionally berries, with low bushes teeming with fruit in cherry red and bright sea blue. From a distance, the gorse hillside looks like old dark green velvet, worn away in parts by the yak trails forming contour lines through the smooth surface. The trail weaves its way alongside and over the river, crossing the torrent on steel pedestrian suspension bridges, some up to 50m long that bounce unnervingly as you walk. I try to avoid looking at the water rushing past a long way beneath. At times the track has given way to a landslide, and scrambling up and over the rock – and occasionally streams – is required, a fun challenge with our backpacks on! When not trekking we’ve been enjoying the delights of eating masses of food, chilling out and playing cards. We nearly came a cropper the other night though. We were playing cards in our room late into the night (ok it was 8:30) electric light on, when we looked around and to our horror found a scene reminiscent of Hichcock’s The Birds. Even though the windows had been closed, sitting watching us from the curtains, ceiling, walls and bedspreads were bugs in their thousands. It seemed that while we were distracted by gin rummy an army had silently swept in and occupied. I swear that you could hear them sharpening their fangs in preparation! Even after a military counterattack involving bright light outside the door and lots of deodorant, we did not sleep soundly – and late night cards is now firmly off the menu. Well, at least until we pick up our mosquito nets from storage in Kathmandu*. Before we set off on the trek, we dropped into the lovely KEEP, the Kathmandu Environmental Education Project which is aimed at ensuring that trekking has a positive (and not, as it sometimes is, negative) impact on the local area, both environmentally and for the people. 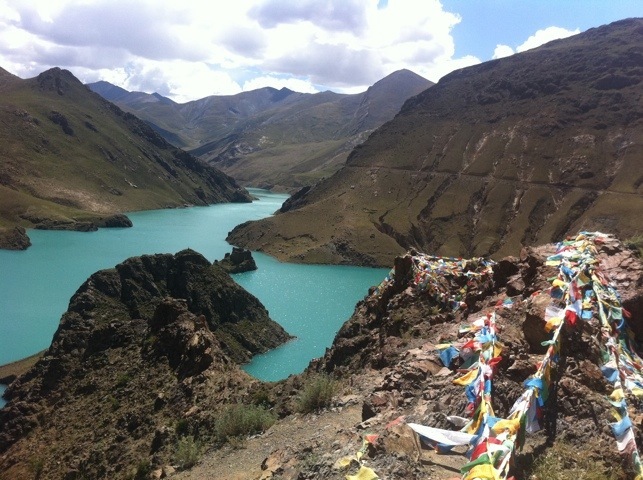 One of the things they provide is support for porters, who eek out a meagre living carrying goods and trekkers’ bags through the mountains, often poorly equipped physically (flip flops, shorts and a t-shirt) – and educationally, with many not aware of the dangers of altitude sickness. One of the other services KEEP provide are log books from other travellers’ recent expeditions, and so we took their advice in where to stay – which is how we ended up at the petite and lovely Moonlight Guest House here. A previous visitor described it as ‘small, cosy and hostile’. We think they meant hospitable! It was lovely last night warming up around the yak dung stove playing cards and eating delicious home-cooked food, including ‘Snickers Momo’, Nepal’s answer to the deep fried mars bar! 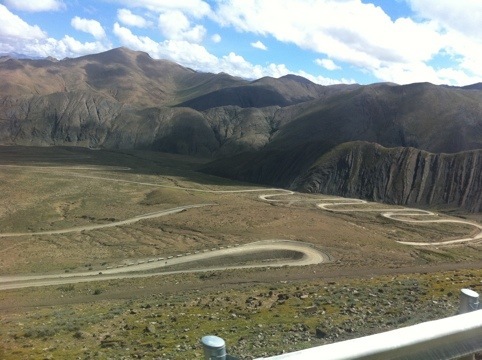 After arriving yesterday, we set off for an adventure to the Lirung Glacier. It soon became apparent that we were following a yak trail instead of one designed for humans, and we wound our way around rocks and over piles of dung, on an ever thinning path. Fortunately, a local old man appeared from a hilltop to guide us (for a fee, of course), taking us through the encroaching mist and rain and finally scrambling over gorse and rocks to the point when we could see the Glacier from (almost) up close. At one point we stopped for a break, and true to British rambler form were able to offer round shortbread, complete with tartan design. We just needed Kendal mint cake to complete the set! Today we hiked up the 1000m or so to the summit of Kyanjin Ri, at 4773m. We now know why it takes two months for people to climb Everest – it’s exhausting! 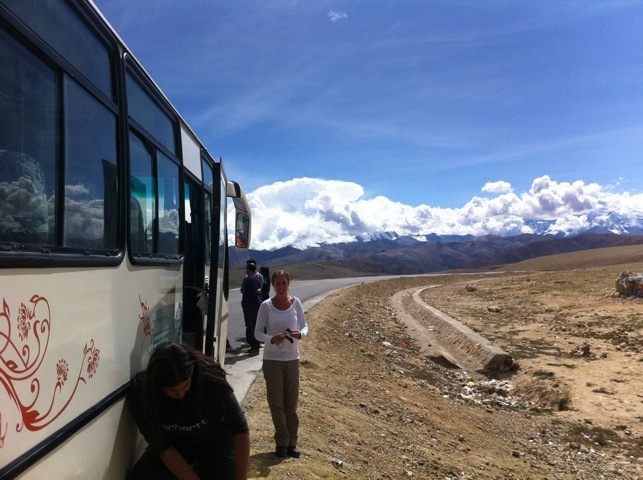 The altitude really hit us – by the end, for every 30m we walked, we had to stop and catch our breath. The view from the top was mainly familiar – dense white cloud surrounding us – and occasionally fabulous, as the mists parted to reveal yesterday’s glacier in full splendour, the set of peaks around, and the now playset-sized town 1km below. Oh, one last thing. So far this blog has enumerated Laura’s addictions to chocolate, fountains, and bells. We have one more for the list: cheese! I’m pretty certain this particular trek was chosen because it culminated in the town we’re currently in, home to a cheese factory. Each day as we’ve surveyed the map of the day’s contours to climb, there’s been a yelp of delight from Laura as she points out the label. Today we visited it first hand, getting a tour around the factory (one room, two minutes), a visit to the cold store (lots of cheese, maturing in rounds on shelves), and our very own purchase of 200g of Langtang’s finest yak cheese. We’ve concluded that the Cheddar region has nothing to fear – it’s a bit like a slightly tougher Edam, and could definitely do with a bit more flavour. They make 6,000 kg of the stuff each year, half of which is consumed locally in the valley, and half of which is exported to Kathmandu – carried out by porter, down the same winding route we’ve just come up. Cheese aside, the lovely thing today is the weather – the past few hours have brought glorious sunshine, so much so that we’re now both sunburnt. Now that I think about it, the red shiny glow we’re both displaying has more than a passing resemblance to the Glacé cherry on the top of this mountain. *You’ll be pleased to hear that a slavering of insect repellent saved us from being bitten.